Here’s a list of some of the terrorist groups in Syria and their origins. Yet some still refer to this carefully calculated and executed invasion as a revolution or civil . Over 300,000 FOREIGN mercenaries invaded Syria to wage war. Steven Sahioune provides us with a detailed account of what took place in the early stages of this imposed war and invasion in his article: The Day Before Daraa: How the war broke out in Syria. “Deraa was teaming with activity and foreign visitors to Syria well before the staged uprising began its opening act. The Omari Mosque was the scene of backstage preparations, costume changes and rehearsals. The Libyan terrorists, fresh from the battlefield of the US-NATO regime-change attack on Libya, were in Deraa well ahead of the March 2011 uprising violence. The participation of local Muslim Brotherhood followers, who would assist the foreign Libyan mercenaries/terrorists, was an essential part of the CIA plan, which was well scripted and directed from Jordan. Enlisting the aid and cooperation of local followers of Salafism allowed the Libyans to move in Deraa without attracting any suspicion. The local men were the ‘front’ for the operation. 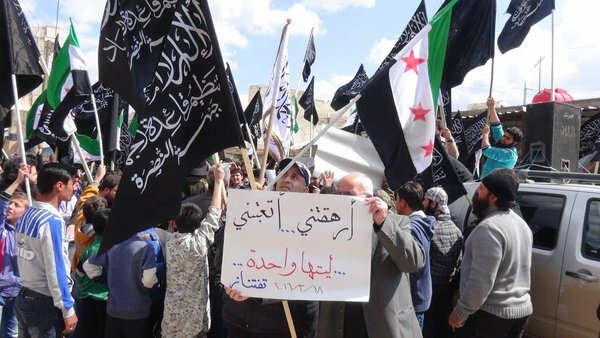 In reality, the uprising in Deraa in March 2011 was not fueled by graffiti written by teenagers, and there were no disgruntled parents demanding their children to be freed. This was part of the Hollywood style script written by skilled CIA agents, who had been given a mission: to destroy Syria for the purpose of regime change. Deraa was only Act 1: Scene 1. The fact that those so-called teenage graffiti artists and their parents have never been found, never named, and never pictured is the first clue that their identity is cloaked in darkness. In any uprising, there needs to be grassroots support. Usually, there is a situation which arises, and protesters take to the streets. The staged uprising in Deraa had some locals in the street who were unaware of their participation in a CIA-Hollywood production. They were the unpaid extras in the scene about to be shot. These unaware extras had grievances, perhaps lasting a generation or more, and perhaps rooted in Wahabism, which is a political ideology exported globally by the Kingdom of Saudi Arabia and the Royal family and their paid officials”. Read Steven’s article to learn more about the details of this staged uprising. In an interview I did with Yasmine from Damascus she described her first hand account with the Daraa demonstration below. Yasmine says, “Al Jazeera, Orient News and Al Arabiya showed a snapshot of a demonstration that happened in Al Hamidia for an entire day, showing the same scene the entire day and claiming that the secret service was using force against demonstrators. I called Al Jazeera to ask them to show more of the demonstration, if it was really as big as they described it, but no one answered. There have been many accounts of Syrians in Syria telling the West that what took place in Syria was not a revolution. One of these accounts is from Majd, he states ” I am Syrian… living in Syria in the middle of everything. We have seen horrors. It was never a revolution nor a civil war. The terrorists are sent by your government. They are al Qaeda Jabhat al Nusra Wahhabi Salafists Talibans etc and the extremist jihadists sent by the West, the Saudis, Qatar and Turkey. Your Obama and whoever is behind him or above him are supporting al Qaeda and leading a proxy war on my country”. Syriana Analysis explains on the sixth anniversary of the war in Syria why it was not a Revolution. “The narrative of the corporate mainstream media is that the vast majority of Syrians resorted to peaceful protests against the “dictator Assad regime”. Eva Bartlett: My October 2015 article, “Deconstructing the NATO Narrative on SyriaDeconstructing the NATO Narrative on Syria“. Excerpts: “…it is known that from the beginning, in Dara’a and throughout Syria, armed protesters were firing upon, and butchering, security forces and civilians. Tim Anderson’s “Syria: how the violence began, in Daraa” pointed out that police were killed by snipers in the March 17/18 protests; the Syrian army was only brought to Dara’a following the murder of the policemen. Additionally, a storage of protesters’ weapons was found in Dara’a’s al-Omari mosque. It is imperative that we listen to these voices and understand that the war in Syria was not a revolution, organic uprising, part of the Arab Spring, or a civil war. Unless we understand this important point we will not be able to understand everything that has happened since March 2011.